We did it, everyone! We've survived another Saturday. Hopefully, it's been a good one. For me, stomping around on Jezebel (read: sitting in my living room in pajamas) just like old times has been some of the most fun I've had in a while. 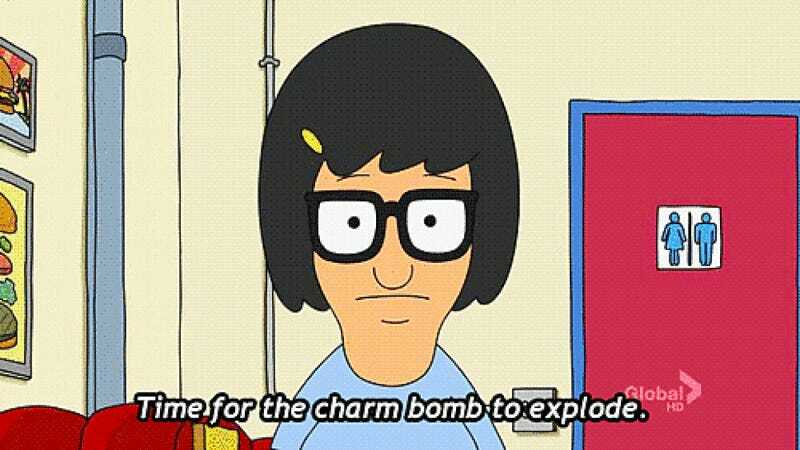 And tonight we celebrate another paragon of fun: Tina Belcher. uhhhhhhhh. If you haven't seen it, here's Dan Mintz's excellent AMA about playing Tina. And if you have seen it, you should probably go get yourself a beverage and relax already. Listen, you've earned it. You're a smart, strong, sensual woman. You did it girl, take a bow. Isha's back tomorrow! Just as soon as I let her out of the closet I put her into like Lucy did on that one episode where Ricky wouldn't let her dance down at the club. Discuss anything and everything in the comments below. See you on Monday! Have an awesome night!